The Huawei Mate 9 will go on sale in the US on January 6th, according to Evan Blass. Huawei has unveiled the Mate 9 in Germany back in November but so far did not officially release the phone in the US. According to leaker Evan Blass, Huawei will start selling it in the US on January 6th. Back in early November, Huawei released the Mate 9 and the luxury Porsche Edition in Germany, both phones have since been available all over Europa. Later, Huawei released the Mate 9 and the Mate 9 Pro in Asia but so far, the US has not seen an official launchdate. While the Mate 9 can be ordered on Amazon, the 32 GB version starts at $789, it is not available from providers in the US yet. This will change soon. According to leakster Evan Blass, Huawei is set to officially start selling the Mate 9 on the first day of CES 2017. 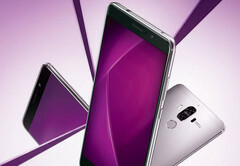 Currently it is not known, if Huawei will also sell the more expensive Mate 9 Pro edition in the US as well. Contrary to the regular one, it comes with a slightly smaller AMOLED-display but features QHD resolution, compared to Full-HD on the Mate 9.